Robin’s passion for working in the natural health field began when she volunteered in the Physiotherapy Department of the Grace General Hospital during her final year of High School. After being hired on as a Physiotherapy Assistant, she decided to pursue this passion and graduated from the Professional Institute of Massage Therapy in Saskatoon in 2007. Since then, while Robin has thoroughly enjoyed providing exceptional care to her clients through manual massages, she always had a yearning to take it a step further – help her clients in a more meaningful way. This is why Robin jumped at the opportunity to bring Divine Spine to the Saskatoon community. 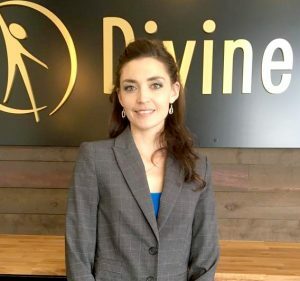 Through Divine Spine’s computerized adjusting technology, Robin is thrilled to be able to offer her clients the premium care they deserve in such a comfortable, enjoyable fashion. When not in the clinic, Robin can be found spending time with her daughters, Bronwyn and Brooklyn.